Now it’s easier than ever to disrupt the internal mechanisms that keep us healthy. We disrupt our circadian rhythm by working long hours and having blue lights on late at night. We harm our metabolism by eating processed foods high in sugar, grains, and trans fats. We increase our stress levels by spending too much time on social media and working when we should be resting. Thanks to these unhealthy habits, more people are suffering from preventable lifestyle diseases that drastically reduce their quality of life and lifespan. Today’s guest, Dr. John Limansky, realized how damaging unhealthy lifestyle choices are when he became a physician. When he visited one of the sickest parts of the USA in Mississippi, he saw 20-year-olds at the end of their lives suffering from obesity, metabolic syndrome, and diabetes — all mainly due to poor nutrition. That’s why he decided to shift the focus of his career and become a preventive doctor. 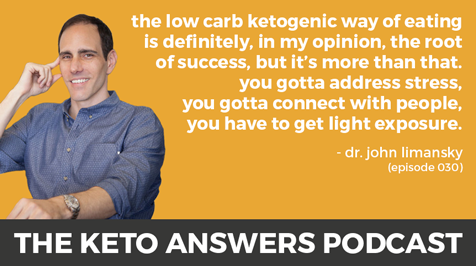 Dr. John Limansky, also known as The Keto Doctor, is a board-certified physician of internal medicine, father of 3, and founder of Biohack MD. Dr. Limansky’s preventive approach is biohacking — the process of making impactful lifestyle changes that boost your health and well-being. Through his medical practice, Dr. Limansky discovered you can prevent illnesses by changing your lifestyle. He started helping people improve their overall health and take some patients off their medication by optimizing their sleep, nutrition, physical activity, and other important aspects of health, instead of just prescribing meds. Today I chat with Dr. Limansky about the most important biohacking strategies he uses to enhance his family’s and patient’s health and exactly what you can do to get started.